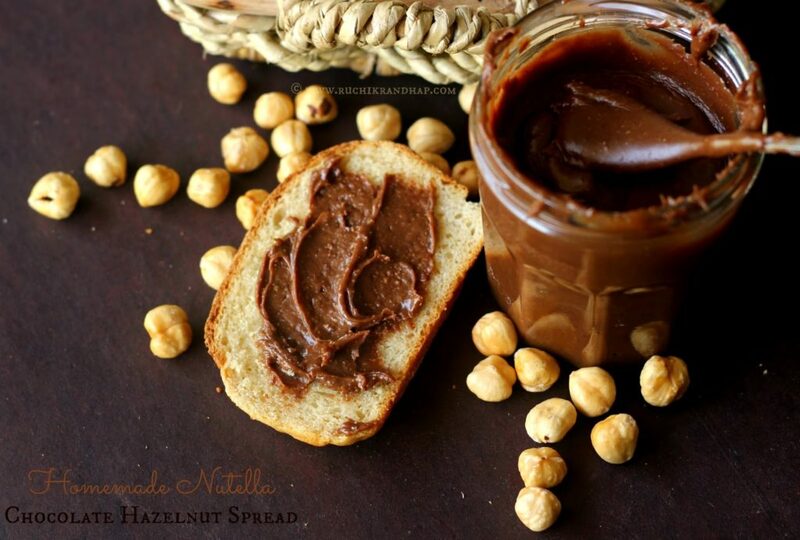 Homemade Nutella (Chocolate Hazelnut Spread) ~ Just Takes 3 Ingredients! I have always been a fan of chocolates. Ice creams don’t interest me much unless the flavour is chocolate. I especially love dark chocolate and can gorge on them any day. Have you ever heard of a mum stealing chocolates from her kids? Now you have 🙂 Well, I don’t really ‘steal’ from them but I do pester my son until he relents. These days when he’s eating some he just comes and pops one in my mouth or lets me have a bite. Honestly, I am surprising myself as I type this. I didn’t think I was such a big chocolate lover but I guess I am so there’s little wonder that I have always enjoyed some chocolate spread on my bread. I have enjoyed baking with it too and Nutella has been my favourite brand. 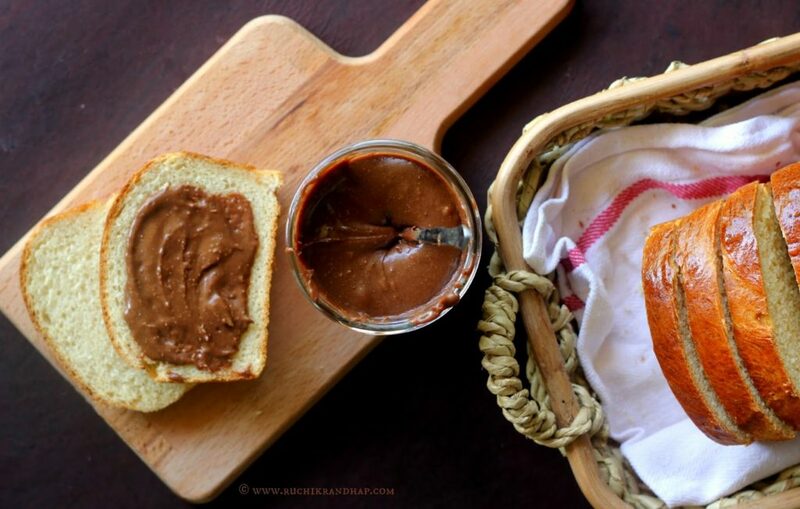 To my luck I had baked a loaf of white bread that day and by the time I would be done with the chocolate spread the bread would be ready to be sliced and slathered upon. Over several taste checks during the process of making this spread I achieved the perfect and spreadable consistency and I couldn’t wait to slice the bread. 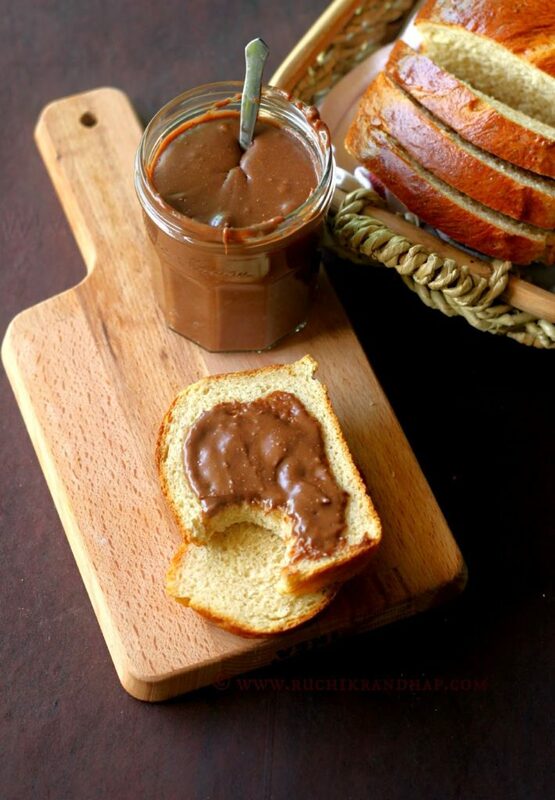 The combination of homemade chocolate spread slathered over a slice of freshly baked homemade bread is something else. Simply heavenly! My kids couldn’t resist licking their fingers and the stunning part was that the chocolate spread tasted JUST like the commercially sold ones! The only catch was that my dry grinding jar is a little old and doesn’t grind small quantities to perfection so getting that smooth texture was almost next to impossible. Nevertheless the grainy texture added to the charm of it being a labor of love and when it is homemade, a few imperfections are pardonable, no? 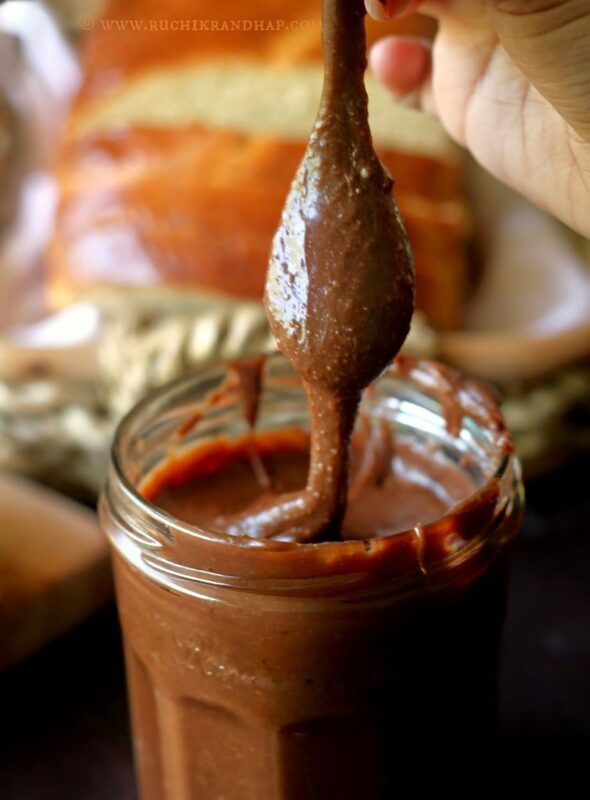 Just like the way that I never intended making a chocolate nut spread at home I didn’t intend posting this recipe today but I guess something sweet is a must today, International Women’s Day! I know I have the habit of correlating things to the ingredients in my recipes so what the heck! Lemme do it once more. I think this spread has a bit of every side of a woman. To all the beautiful, kind and courageous women out there who show strength of character in every moment of their lives, may you have a nutty, sweet, intensely delicious day today! 3. Now melt the chocolate in a double boiler – Place some water in a saucepan and a bowl over it taking care to see that the base of the boil does not touch the water – now add the chocolate into the bowl and let it melt over the simmering water. Take care to see that not a single drop of water gets into the bowl of chocolate or it will immediately turn into a hard and lumpy mess. 4. When the chocolate has melted and looks glossy, add the condensed milk and mix till incorporated. 1. Always buy fresh stock of hazelnuts – old nuts tend to have slightly dark coloured bitter centres. Also, old stock can get infested very soon, so it is preferably to give the nuts a quick wash if you will roast them in the oven. 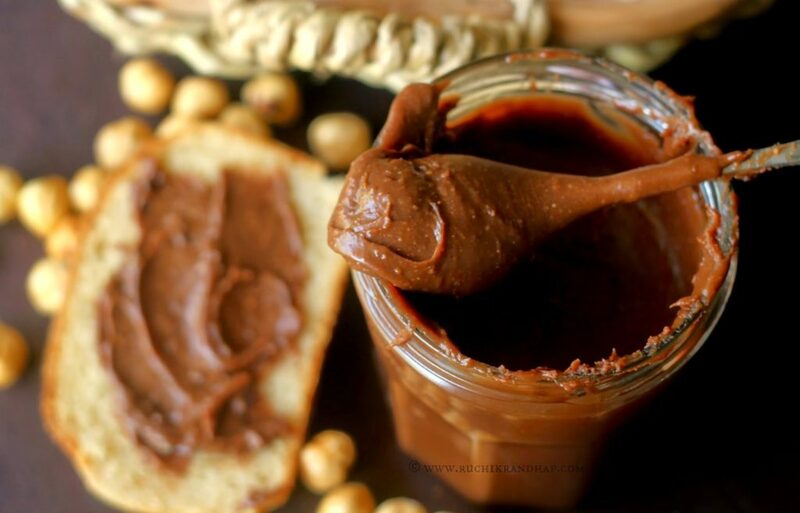 Take care to ensure that whichever method you use to roast (oven or stovetop) there is no moisture remaining on the nuts or your chocolate spread will spoil fast. 2. If you don’t find hazelnuts where you live, try making this with almonds. Do remember to blanch them. To blanch, place them in a bowl and pour boiling water over them, cover the bowl and keep aside for 15-20mins after which the skins will peel off easily. Pat dry (completely) and proceed with the rest of the recipe. 4. You may add some pure vanilla extract if you wish but I skipped it. @ Rafeeda: You must try this Rafee…you will love it!